The Iliad is universally acclaimed as a truly great story. There is war and gore, honour and betrayal, pain and pathos, love and hatred, a good few villains and even more heroes, all set in the good old days of a glorious but not forgotten past. Above all, the Iliad presents the tragic yet thrilling reality of humanity's mortality, and as the events unfold, we are ever reminded that our lives are shaped and buffeted by the winds of Fate from which even the central character Achilles, magnificent warrior that he is, cannot escape. 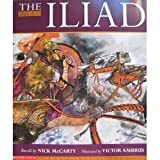 The Iliad, written sometime in the 8th century BCE, is a tragic epic poem of more than 15,000 lines organised by scholars in Alexandria into 24 books. Book 10 is thought a possible later addition on stylistic grounds, but it could also be a deliberate attempt at an intermission in the narrative. Most historians agree that what we have today is the complete original version. The poem covers a mere 52 days of the Trojan war between a combined Greek super army & the Trojans, protected by the massive walls of their city, Troy. The poem covers a mere 52 days of the Trojan war between a combined Greek super army and the Trojans, protected by the massive walls of their city, Troy (aka Ilium) in Anatolia. The story and characters were already familiar to its original Greek audience after centuries of oral tellings and retellings. This oral heritage is seen in the repetition of epithets, introductory phrases, fighting descriptions, and mirrored parallel sequences in an ever-recurring cycle of themes and ideas. The listeners and readers already knew why the war started – the Trojan prince Paris has abducted Helen of Sparta and her husband Menelaus has persuaded his brother, Agamemnon, king of Mycenae, to form a mighty Greek army to get her back again. They knew the ending, too, and so the Iliad does not bother with that either. Homer seems more concerned with the universal truths the story can reveal, and so, perhaps for this reason, he jumps right into the story after already nine years of war and siege. The Greeks' greatest warrior is Achilles, Mr. Invincible, but he is now sitting out the war in a big sulk because Agamemnon, 'lord of men,' has stolen his prize, the girl Briseis. His anger and pride will have all sorts of repercussions and almost bring total defeat for the Greek army. Only a tragedy will convince Achilles to fight, sweep the plains of Troy clear of the enemy, and finally meet his own tragic fate. The gods look on with occasional interest and sometimes with direct intervention, but they are immune from the horrors that unfold, and they know it. Both gods and men must ultimately bend to the will of Zeus, the 'Cloud-Gatherer' and king of the gods. Agamemnon rashly tries to storm Troy without Achilles, thus making himself even more unpopular with his men. There is a catalogue of ships which lists all the cities taking part in the war. It is long and impressive. 'Godlike' Paris challenges Menelaus, 'master of the war-cry,' to a one-on-one fight to settle the war there and then. Helen bites her fingernails from the walls of Troy as Paris, wearing slightly flashy and inappropriate armour, is soundly beaten, but 'quick-glancing' Aphrodite steps in and whisks off the prince in a cloud. The war does not end this day. The gods argue about the progress of the war, but Athena and Hera insist that Troy must be destroyed. Zeus consents, but in return, he will destroy cities of his own choosing and at his own leisure - Mycenae will be one of them. Meanwhile, the two armies clash and the plains run with rivers of blood. The fighting continues, and the mighty Greek Diomedes kills all before him. The hero even attacks Aphrodite and Ares, but he finds himself no match for Apollo, the 'far-shooter,' in a scene which reminds of the unbridgeable gulf between gods and men. The fighting on the plains continues and Diomedes meets Glaucus, but instead of fighting, these two champions have a chat and realise they are of mutual descent. They exchange some gifts of armour and part as friends, a little oasis of humanity in the pitiless desert of war. Meanwhile, inside Troy, we meet Hector's wife Andromache to remind us that the Trojans are not dissimilar to the Greeks and their women are equally worried for the future. Hector, 'tamer of horses,' son of king Priam and greatest Trojan warrior, challenges any Greek to combat. Agamemnon persuades Menelaus not to accept, and instead, Ajax, having drawn lots for the honour, marches out to meet the prince. The pair clash but without a decisive blow, and Ajax proves the master. Darkness then calls a halt to the fight and they part, once again loaded down with gifts. The next day a truce is called so that the dead can be gathered and cremated. Slightly fed up that the war has not ended by now, Zeus absolutely forbids the gods to intervene this day. Hector is magnificent and leads his army in a rousing charge which pens the Greeks back behind their fortified camp by the shore. Hector camps his army outside the city, such is his confidence in total victory the next day. Things look so bad that Agamemnon considers throwing in the towel and sailing home, but he is persuaded to try and tempt Achilles to rejoin the fight by offering him a mass of treasure. Odysseus (wily king of Ithaca and especially smooth talker) leads Phoenix and Ajax who all tell Achilles to think of the men, their suffering, and the glory he can win. Achilles refuses and now loses the moral high ground. His pride will cost many lives. A sort of intermission where both sides hold a meeting and decide to send spies into the enemy camp to check out their positions and weaknesses. The Greeks come out of their camp fighting as never before and drive the Trojans back to Troy, but then the tide swings and the Greeks are forced to retreat with many wounded, including Agamemnon and Odysseus. The Trojans, with Hector and Sarpedon leading the way, break down the walls and smash the gate of the Greek camp. The Greeks panic and flee for their ships. The Greeks receive the help of Poseidon, the 'Earth-Shaker,' and they drive back the Trojans, wounding many and killing even more, including Ascalaphus, the son of Ares no less. To keep the momentum with the Greeks, Hera, with the help of Aphrodite, distracts and seduces Zeus on Mt. Ida. Hector, meanwhile, is injured by a rock thrown by the now less-than-friendly Ajax. Zeus awakens to see the Trojans in peril and forbids any more intervention from Poseidon. Apollo joins the fighting, and with his help, the Trojans once more drive the Greeks back into their camp. Hector, enjoying his best day of the war, leads his men to the ships and calls for fire to set them all ablaze. A key book. Patroclus, best friend of Achilles, remembers the advice of Nestor and begs the great warrior to join the fighting and, if not, then allow him to lead the fearsome Myrmidons wearing Achilles' armour. Achilles consents and the fate of his friend and his own is now sealed. The Myrmidons manage to put out the fire amongst the ships, and Patroclus even kills Sarpedon but then rashly charges the Trojans back to Troy. Apollo intervenes and strikes the hero's armour from his body, and he is killed by the spear of Hector. Now Achilles will be really angry. Troy's fate is also sealed this day. The two sides fight for the body of Patroclus, but the Trojans win and strip his body. Hector dons the armour of Achilles, but the Greeks renew their efforts and finally manage to take the naked corpse back to their camp for proper burial. Achilles is told of the death of his friend and is predictably livid. He swears revenge on Hector. To fight, though, he needs armour, and this is promised him by his mother Thetis who enlists the master craftsman god Hephaistos. There follows a lengthy description of Achilles' new shield which is decorated with a myriad of fantastic scenes. Agamemnon and Achilles are reconciled and everyone has a big feast before the big battle of the 'morrow. Achilles knows now that he will die, and it will be at the hands of Paris and Apollo, but revenge drives him on undeterred. Zeus calls for the gods to take their places in the coming battle. Ares, Artemis, Aphrodite, and Apollo will aid the Trojans while the Greeks have Hera, Poseidon, Hermes, and Athena. Battle commences on the plains. Achilles sweeps all before him, but Hector is saved from a confrontation by Apollo who whisks him away in a cloud. Achilles is still chopping away at the Trojans and bags himself 12 captives to slaughter later at the funeral of Patroclus. He drives so many of the enemy into the river Xanthos that the river god rises in indignation and chases Achilles back to the Greek camp. The gods begin fighting each other in a painless and inconsequential parody of the more brutal battle on the plain. Meanwhile, the Trojans are driven back, and all flee into their city, all except one: Hector, who makes a stands at the Skaian Gates. Hector, blaming himself for his own stupidity and camping out on the plains instead of safely inside the city walls, prepares to meet his fate. Priam bites his fingernails from the walls of Troy as he sees Achilles approach in his gleaming armour. The sight of the great warrior speeding towards him causes Hector to flee, and the pair indulge in a chase around the city three times. Zeus then weighs the golden scales of Fate and Hector's side sinks. 'Swift-footed' Achilles catches his man and sends him to Hades with a single spear strike to the throat. Now Troy really is in trouble. Shockingly, Achilles ties the body of Hector to his chariot and drags him ignominiously back to camp. Having got his revenge, Achilles now sets about honouring Patroclus with some funeral games which include chariot races and prizes for all the winners. It is a break for everyone before the emotional drama of the final book. The gods are angry at Achilles' disrespect for the body of Hector. Thetis is sent to appeal to him. At the same time, Priam is helped by Hermes to magically appear in the Greek camp on his own mission of mercy. Achilles bows to Priam's moving speech and releases the body of Hector for proper burial. Here the Iliad ends. The demise of Hector is Homer's metaphor for the fall of Troy itself as the Iliad's story ends here, if not the actual war. We still have to come battles with Amazons and the death of Achilles, felled by an arrow to his heel from Paris' bow. Paris is shot by Philoctetes, and Ajax goes mad and slaughters a load of sheep before committing suicide after not getting the armour of Achilles. Then, after the Trojan Horse ruse to gain entry into the city, Troy finally falls and is ruthlessly sacked. The archaeological site of Troy in Anatolia, first excavated by Heinrich Schliemann in the late 19th century CE, has revealed a city with a history of habitation over thousands of years. Of the several cities built on top of each other, Troy VI (c. 1750-1300 BCE) is the most likely candidate for the besieged city of the Iliad. Impressive fortification walls with several towers certainly fit the Homeric description of ‘strong-built Troy.’ The lower town covers an impressive 270,000 m² and suggests a grand city like the Troy of tradition. Bronze arrowheads, spear tips, and slingshots have been found at the site and even some embedded in the fortification walls, suggesting some sort of conflict. These date to around 1250 BCE which correlates with the traditional date for the Trojan War. Conflicts over generations between the Mycenaean and Hittite civilizations are more than probable, colonial expansion and control of lucrative trade routes being prime motivators. While such conflicts are unlikely to have been on the scale of Homer’s war, collectively, they may well have been the origin of the epic tale of the Trojan War which has fascinated for centuries. Carpenter, T.H. Art and Myth in Ancient Greece Paperback. (Thames & Hudson, 2017). Fields, N. Troy c. 1700-1250 BC. (Osprey Publishing, 1771). Cartwright, Mark. "Iliad." Ancient History Encyclopedia. Last modified March 10, 2017. https://www.ancient.eu/iliad/. Cartwright, Mark. "Iliad." Ancient History Encyclopedia. Ancient History Encyclopedia, 10 Mar 2017. Web. 19 Apr 2019. Written by Mark Cartwright, published on 10 March 2017 under the following license: Creative Commons: Attribution-NonCommercial-ShareAlike. This license lets others remix, tweak, and build upon this content non-commercially, as long as they credit the author and license their new creations under the identical terms. Please note that content linked from this page may have different licensing terms.